Special Containment Procedures: SCP-368 has not yet warranted any need for containment. Though it has the movement patterns and behavior common to a normal bird, neither it nor any of its copies (see Addendum) have shown any desire to migrate from the offices in which they are stored. SCP-368 in a rare moment of inactivity. 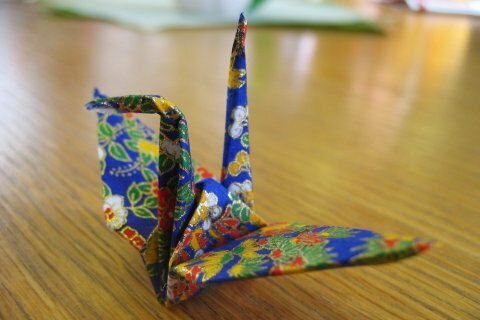 Description: SCP-368 is an animate origami crane folded from ornate, heavy-stock paper. Left to its own devices, it will perch, preen, fly from platform to platform, groom, and occasionally construct a makeshift nest out of nearby office supplies. It responds to human touch affectionately, much as a domesticated bird would. The item's demeanor is, on the whole, friendly, and it has been observed to perch on the shoulders of various SCP personnel. Though the item needs no source of nourishment, it appears to "sleep" at night in that it places its head under its wing. Studying the physical properties of SCP-368 has proven difficult: the item seems to interpret attempts to capture or contain it as a game and has displayed considerable agility and resourcefulness in evading even the most focused attempts at containment. How SCP-368 stays airborne and maintains its stability while airborne are still not known. History: SCP-368 was discovered in an office building in ████████, Japan, in 19██. ███ ████ (now employed as [14-1158]), a former employee at the aforementioned building, found the item in a closet full of office supplies. Upon discovery of SCP-368, 14-1158 managed to gain its trust in order to move it to a more secure location. Psychological evaluations of 14-1158 indicated her to be of sufficient mental stability and acuity to warrant a position within the SCP organization. Cross-SCP Warnings: It is recommended that SCP-368 be isolated from SCP-529 and SCP-530, as contact will almost certainly alarm all three SCP's. Addendum 0-22: On ██/██/20██, while housed in Research Sector 15, SCP-368 began displaying unusual behavior. Instead of its normal routine of human interaction, grooming, and play, it began hovering over a photocopier (serial number ██████████), "flattening" itself whenever SCP personnel approached. Dr. █████ ██████ ([19-1425]) placed SCP-368 into the photocopier and made a copy, upon which another sheet of paper of identical pattern but different hue emerged from the copier and promptly folded itself a shape mimicking that of the original. SCP-368 and the new specimen (referred to as SCP-368α) resumed usual behavior. Since then SCP-368 has displayed similar behavior at intervals varying between two and four years, while the copies have shown no such behavior. Though initially Overseer O-█ disallowed any employee from aiding in the reproduction of SCP-368, and Dr. █████ ██████ was reprimanded for his action, remarkably high employee morale at Research Sector 15 led to the introduction of the progeny of SCP-368 at further SCP facilities.